These wallets have interior dividers made from game-used NHL jerseys. With an interior divider made of a game-used jersey from your choice of NHL team, this wallet is a fun, functional way to carry your fandom with you wherever you go. Each piece of hockey history is hand-cut and selected to feature at least two colors of the iconic uniform. Having come right off the ice in a regular season game, the fabric shows varying amounts of authentic wear. 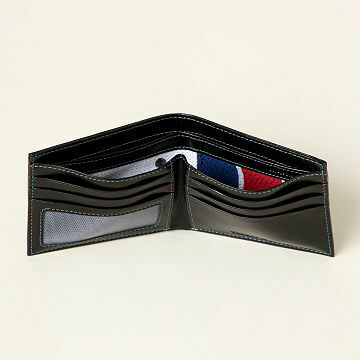 The divider helps organize your cash, a mesh pocket holds your I.D., five interior slots keep credit cards handy, and your favorite team's name debossed on the front adds a slap shot of style. Made in India. Officially licensed by the National Hockey League, each wallet includes a tamper-evident hologram sticker on the uniform piece to ensure authenticity and comes gift-boxed with an authentication instruction card. This is perfect for any hockey fan! Great quality, my husband loved it! High quality material with fantastic nostalgia. My husband uses it everyday as his wallet. I catch him smiling sometimes when he opens it and sees the penguins uniform colors inside. This is a classy, well-made, stylish wallet. My boyfriend is going to be so excited!! My boyfriend will use it every day and know that a ranger fan is with him! The wallet was beautiful designed and stylish. My boyfriend is so happy. The wallet's interior with the jersey showing was incredible. The downside is that he was unable to put all of his cards inside it but the quality and design more than make up for it.